One of my little pet peeves is an application that has hard-coded look ups for specific Active Directory groups or specific SharePoint groups in order to activate certain pieces of functionality. While this works and makes sense to most programmers it lacks a certain amount of elegance and of course locks you into the groups and their roles that have been defined during the initial design and development of the application or website. I think it is much more cleaner to instead create roles or permission levels and grant them to groups in order to activate the functionality you want. The advantage of architecting your solution this way is that it allows the end user admins to create their own customized set of groups after the application has been rolled out without having to deploy additional code. 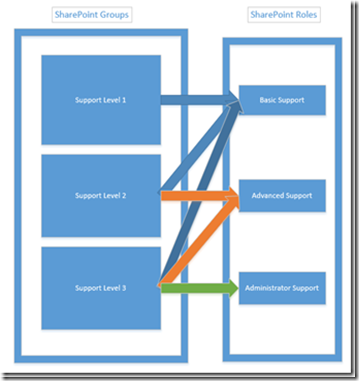 The way I usually set up a SharePoint group is as a container for individuals and AD groups, and then specify the customized permissions for each group. 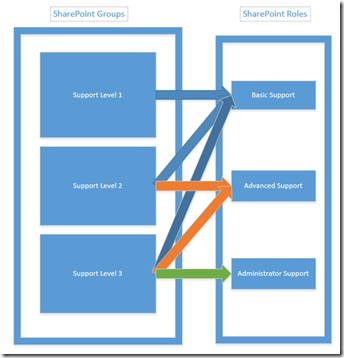 What this does for me is I now have 3 different support groups, but instead of having to check for if the user is a member of one of 3 SharePoint groups, I just have to check if the collection of AllRolesForCurrentUser has my custom defined role in order to activate the functionality. And if later I want to add another SharePoint group called “Support Administrator” that only has access to the Administrator Support functions, I can do this from within the SharePoint UI after the application has been deployed. In the Manage section of the ribbon, click Permission Levels. On the toolbar, click Add a Permission Level. On the Add a Permission Level page, in the Name field, type a name for the new permission level. In the Description field, type a description of the new permission level. $customPermissionLevel.Description="Description: Custom Permission Level Test"
And it can be used to grant this permission level to specific SharePoint Groups or even individuals. Now that we’ve got our custom role and assign it to a user or group so it will show up in the user’s AllRolesForCurrentUser, how do we use it? 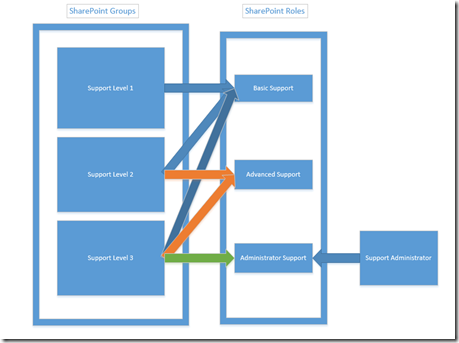 And now we have a SharePoint application that is permission level aware instead of group level aware. We can create as many groups or individuals as we want and assign them these permission levels without having to recode the application to check for these groups, and the business units can mix and match permissions however they want as the group and business needs change during the lifecycle of the project.